The Mharoti Dragon Empire is the scourge of Midgard and the Southlands alike. The vast armies of the Dragon Empire march relentlessly across the known world in their endless wars of conquest, spreading fear and chaos wherever they go. The creatures that make up the Mharoti forces are powerful and frightful, ranging from deadly kobold ambushers mounted atop camouflaged drakes to elite companies of the finest dragonborn warriors ever seen. Feared by the Mharoti and their enemies alike, these are the terrors of the Dragon Empire. Kobolds are the largest single racial group in the Mharoti army, and just as wild kobolds unquestioningly serve mighty dragons, so too do these civilized kobolds serve the mighty Dragon Empire. Most kobolds legionnaires are mere infantry, using kobold stats—with kobolds in especially well-supplied corps wearing scale armor (AC 16) and wielding spears (+4 to hit, Hit: 5 (1d6 + 2) piercing damage). More specialized kobold regiments employ kobold scouts and kobold ambushers, both of which are trained to operate with a camouflage drake. Kobold scouts are trained in the art of moving unseen on drakeback over large stretches of land. When stealth fails, these scouts are adept at fighting on the run. Unlike typical kobold warriors, these scouts are trained to operate individually, or in very small groups. As such, they aren’t used to fighting in packs like other kobolds. 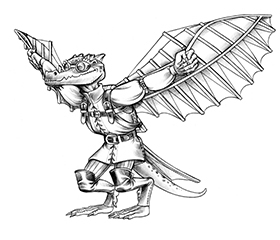 Even without their drake mounts, most kobold scouts are blessed with the gift of flight, and can use their wings to travel great distances. Kobold ambushers also employ stealth to deadly effect, preferring to lay in wait for hours or days at a time. Ambushers also typically operate in units of ten or more, using their numbers and their pack tactics to devastate their targets even after the initial ambush. While these advantages make them formidable combatants even without the element of surprise, these lightly armored kobolds rarely try to salvage a failed ambush, preferring to scatter in all directions and meet up and a predetermined rendezvous point. Camouflage drakes are squat, sand-colored quadrupeds with tiny, vestigial wings incapable of lifting their muscular forms. Despite lacking the ability to fly, these drakes can change color to blend in with their environment, and can run as fast as a horse at its top speed. 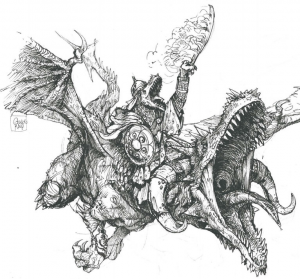 These bestial creatures lack the shrewd cunning of true dragons, but are still intelligent enough to work in perfect tandem with their kobold rider. Cunning Action. On each of its turns, the kobold scout can use a bonus action to take the Dash, Disengage, or Hide action. Skirmishing. The kobold scout deals an extra 14 (4d6) damage whenever it hits a target with a weapon attack on its turn, and has moved at least 30 feet that turn. This includes movement made while mounted. Stealthy Traveler. The kobold scout can move stealthily at a normal pace while traveling overland. Shortsword. Melee Weapon Attack: +6 to hit, reach 5 ft., one target. Hit: 7 (1d6 + 4) piercing damage. Shortbow. Ranged Weapon Attack: +6 to hit, range 80/360 ft., one target. Hit: 7 (1d6 + 4) piercing damage. Assassinate. During its first turn, the kobold ambusher has advantage on attack rolls against any creature that hasn’t taken a turn. Any hit the ambusher scores against a surprised creature is a critical hit. Camouflage. The kobold ambusher has advantage on Dexterity (Stealth) checks made to avoid being seen on a turn in which it has not moved. If it does not move for at least 1 minute, it cannot be seen unless directly interacted with. This effect ends if the ambusher moves. Pack Tactics. The kobold ambusher has advantage on an attack roll against a creature if at least one of the ambusher’s allies is within 5 feet of the creature and the ally isn’t incapacitated. Sneak Attack. The kobold ambusher deals an extra 7 (2d6) damage when it hits a target with a weapon attack and has advantage on the attack roll, or when the target is within 5 feet of an ally of the spy that isn’t incapacitated and the ambusher doesn’t have disadvantage on the attack roll. Read more on kobolds and other Mharoti terrors—and read other great articles—in Warlock, only on Patreon!